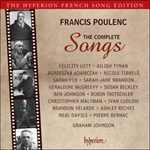 These songs, harmonizations and arrangements of Polish melodies, were made by Poulenc at the request of the Polish soprano Maria Modrakowska (1896–1965) with whom the composer-pianist toured Morocco in 1935. It was Modrakowska who chose the songs and provided the notes on their historical background. Poulenc thought her ‘incomparably gifted’ and that she ‘sang divinely’. To his consternation and disappointment, the singer disappeared inexplicably from his musical horizons after this collaboration. 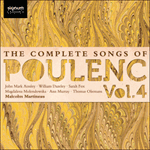 Poulenc compared this work with Ravel’s arrangement of Greek folksongs (Cinq mélodies populaires grecques). When writing those arrangements Ravel had a free hand, largely because, as Poulenc put it, he had no ‘ghost of an Athenian Chopin’ to haunt him. The work as a whole is, almost inevitably, a homage to the Polish composer whose music Poulenc so loved. The poems come from the period when Poland was occupied by Russia, Germany and Austria, a baleful state of affairs that gave rise to the Polish insurrection that began on 29 November 1830 (known as the November Uprising) and continued into the autumn of 1831. This was a valiant revolution of patriotic combat and fervour, but it was eventually crushed by Russia because none of the big powers came to the aid of the Poles. It made a difference of course to both Modrakowska and Poulenc that the outcome of this struggle was of crucial importance to the expatriate Chopin; he had left Poland to begin his European career shortly before the November Uprising, and his heart was entirely with his countrymen. His angry disappointment and fury at the eventual victory of the Russians knew no bounds. Poulenc dedicated each song in the set to an important female member of the expatriate Polish community in Paris—including Ida Godebska, Misia Sert, Marya Freund and Wanda Landowska. ‘Don’t go, Janek, don’t go! Death lies in wait for you there. The poem is by Franciszek Kowalski. It tells the story of the young girl weeping as her betrothed goes to war, joining the army reunited at Lublin. The melody is entitled ‘The young girl and the Krakouss—the soldier from Krakow’. Poulenc’s arrangement is in the two contrasted speeds of the mazurka form. His opening ritornello is one of the most successful Chopin evocations of the set. Jaunty fellows and old campaigners. if I die an idle death? The poem is by the famous popular poet of the period Stefan Witwicki, friend of Chopin and dedicatee of the Op 41 Mazurkas. The melody used here is a popular song, another mazurka with faster and slower sections. Chopin’s song Wojaka is a setting of the same poem with original music. The time has come, let me go! Had I died idle and indolent? and the victory will surely be ours. This song, cheekily harmonized by Poulenc, and alternating between fast and slower tempos, was originally sung by enthusiastic crowds at Warsaw’s National Theatre, on 8 February 1831, in honour of General Józef Chłopicki. The first battle in the Russo-Polish war took place six days later. A hundred avengers shall arise. And the victory shall be ours. ‘Czy pozwoli Pana Krzysia?’ młody ułan pyta. W pierwsza parę ją ponosi, a sto par za niemi. Pannie tłucze się serduszko, i liczko się płoni. Lube dziewczę porzuć smutki, dokonczym mazura. Trabka budzi, na koń woła, mazur to ostatni. and they lead a hundred couples in the dance. her heart beats faster and her blushes flame her cheeks. for the battle draws close, half a mile away now. The first shots ring out, reveille sounds, to horse, hurra! one more circle and then we’ll embrace! The bugle calls, calls to horse: this is the last mazurka! Poulenc harmonizes a melody here that was created in the period of the November Uprising, and sung in honour of Chłopicki’s troops as they departed for the front. It remained famous until the First World War where the uhlans, troops of General Józef Piłsudski, adopted it as their theme tune. Piłsudski was the aged, and increasingly despotic, leader of Poland at the time that Poulenc and Modrakowska first performed these songs. The mournful mazurka is marvellous grist to Poulenc’s mill; a number of his songs from here on are tinged with exactly this kind of Chopin-influenced tristesse. The final line, suddenly marked Très vite, comes as something of a surprise. “Krzysia, will you dance with me?” asks young uhlan. Sweeps her off to dance as first pair, a hundred others follow. Girl’s heart is pounding, cheeks blush. Battle rages half a mile away, first shots are heard. Shots are heard, reveille is sounded, mount horses, hurrah! My dear girl, do not be sad, we shall finish the mazurka. The bugle sounds wake-up call, this is the last mazurka. Co przy mojej lancy drży? Ona piekna tak jak ty. perhaps I’ll return, perhaps not. This text of fateful leave-taking is by Maurycy Goslawski (1802–1834), famous for his Poems of a Polish Outlaw. At the time of the Insurrection of 1830–31 he had been a member of the Russian army, but deserted in order to become an ‘uhlan’ and join the revolutionary cause. He died in prison in Stanislawów. The poem has twenty strophes of which four are set here. This is one of the two songs in the set (the other is the first) where Poulenc allows himself a postlude; this one is particularly haunting. She is as beautiful as you. I may come back, I may not. To płakała, to wzdychała, śląc modły do Boga. crying, sighing, praying to God. and off to fight the foe! Rajnold Suchodolski (1804–1831), the poet of this text, was the younger brother of January Suchodolski (1797–1875), who was a famous painter of military pictures. Rajnold was one of the many talented and idealistic young Poles who lost their lives in the November Uprising. She cried and sighed, supplicating God. Let us fight the enemy. as a token of its love. After six songs connected with the November Uprising, Modrakowska appends two folksongs to this set of arrangements and harmonizations. This is a song in honour of the Vistula, the longest and most important of Poland’s rivers, passing through many towns on its way to the Baltic, including both Krakow and Warsaw. The song from Krakow was popular with all Polish schoolchildren of the time, and the singer on this disc remembered it from her own childhood. She adorned Cracow with a sash. It is never forgotten, even in a grave. Bystra woda w tobie jest. Jakże ja nie mam więdnieć? Gdy już nie jestem cały. you are withering on my head. How can I not wither too? are already falling from me. This is perhaps the most original arrangement of the set—for the first page the vocal line is harmonized by a single line of piano-writing. The melody is a peasant song from Polish Silesia and Poulenc brings to it a haunting modernity that is lacking from the other songs that are, after all, character pieces from a definite historical epoch. Chopin and his style simply had to be present in music from a period where he was almost an active participant in the political events of the time. But here, Chopin plays no role. This is the song that brings to mind the folksong-arranger Ravel with whom Poulenc compared himself in JdmM. Fast waters flow through you. You wilt on my head. How can I not wilt? I am no longer intact.